Lentils are a filling and nutritional substitute for meat. Apart from being a store cupboard essential that can be added to many meals they are ideal for vegetarian dishes such as this tasty lentil curry. Place lentils into a pan and add vegetable stock. Simmer until soft and drain water. Meanwhile, heat oil in a deep pan. Add onions and cook until soft. Add garlic and curry powder or garlic and dried spices. Heat contents until spices are sizzling. Add lentils and chopped tomatoes and simmer for fifteen minutes. Serve immediately. This can be served with halved boiled eggs and rice or a green salad and fresh homemade naan bread. Prepare as above but add chopped carrots, chopped red peppers with the onions then add chopped courgettes, small cauliflower florets and button mushroom before simmering for fifteen minutes. This meal will give you all of your five vegetables for the day. It is possible to have all of the above ingredients in your freezer and store cupboard and be able to make a tasty lentil and vegetable curry in next to no time. It is better to prepare this meal fresh rather than freeze the completed meal as the vegetables can become quite slushy when the meal is defrosted. Try blitzing the curry in a blender for a thick wholesome soup. This is very tasty served with herb dumplings or crusty French bread on a cold winters evening. 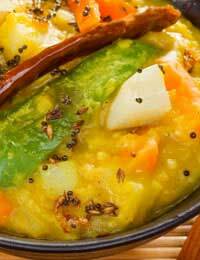 Cook as the lentil curry but double the amount of onions and slice rather than chop them. Par boil three large potatoes that have been cut into one inch cubes. Add the potatoes when you add the lentils and simmer until the potatoes are cooked through. Small cauliflower florets are also very tasty with this recipe. If you find yourself catering for non vegetarian guests any of the above recipes can be altered to cover meat eaters and vegetarians. Simply divide the recipe in half and use two pans at the same time. When browning the onions add a sliced chicken fillet to one pan and continue cooking. Stir in a small carton of natural yoghurt or half a cup of coconut milk before serving. If you prefer a thicker curry add tomato paste near the end of cooking and simmer to reduce the liquid. Alternatively add some dried mashed potato mix or mash some of the potatoes into the gravy to thicken the recipe. Cooked diced beef or lamb can also be added to make a vegetarian curry into a meat version for guests but make sure that it is heated through thoroughly before serving.